The season is quickly changing from sunny to rainy, and part of the fun of switching seasons is the chance to update our wardrobe. Not only do we need to bring our jackets and raincoats out, but we also have to fill our shoe closets with reliable footwear that will not fail us during this season. Crocs, the world’s favorite comfort shoe brand, is the perfect pair in any weather. Find one that suits you and enjoy up to 90% off at the much awaited sale event of the season, the Crocs Epic Sale. Back due to popular demand, the biggest sale ever is set to delight Crocs fans with amazing discounts on a wide selection of designs. 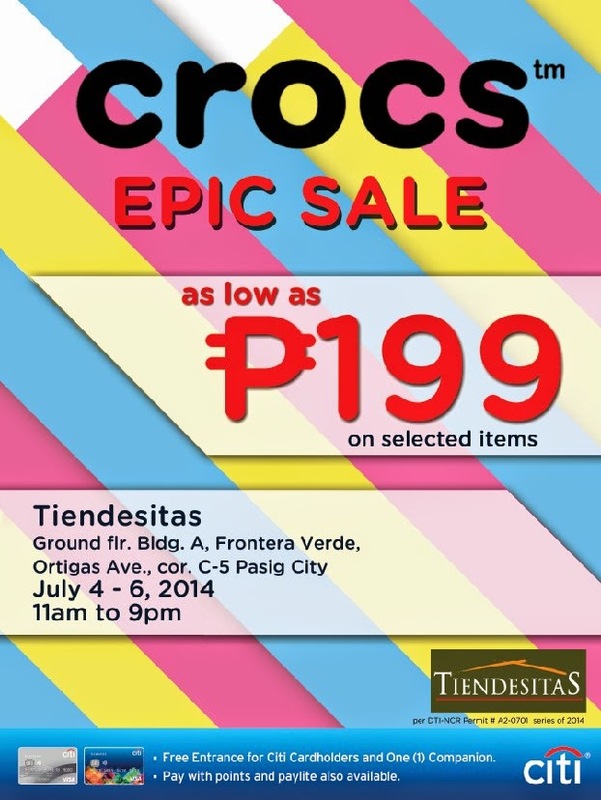 The Crocs Epic Sale will be at the Ground Floor of Bldg A., Frontera Verde, Tiendesitas from July 4 to 6, 2014. A special preview sale for Citibank cardholders will be held exclusively on July 03, 2014. For more information, simply like Crocs Philippines on Facebook and follow @crocsph on Instagram and Twitter.